How to add Clinic Information? How to add, edit, and delete Branch? 3. Key in the information in Branch Editor (Brach Name, Telephone, Fax, Address, Postal, Country, Emergency Telephone, Open Hours, Close Hour, and Close Day). c. Click OK to save changes, or Cancel button to cancel changes. c. Click OK when you get confirmation to delete. Or click No or Cancel when decide to cancel the deleting. How to add, edit, and delete Patient Visit Purpose? - Click the Patient Visit Purpose from the list. b. Click OK to save changes, or Cancel button to cancel changes. 3. Key in the information in Registered Companies Editor (Company Name, Registered No, Address, Postal, Select Country, Phone, Fax, Tax Rate, Website, and Email). If you want to add picture, double click square box for picture. How to add, edit, and delete Doctor? 2. Vanda Enterprise Edition limited for 4 clinic doctors, unlimited for referral doctor. - Click Edit button or Double Click the selected doctor. - In clinic Doctor Editor, click Edit button. - Edit the doctor information. - Select Data Item Drop Down List. - Key in the data value. 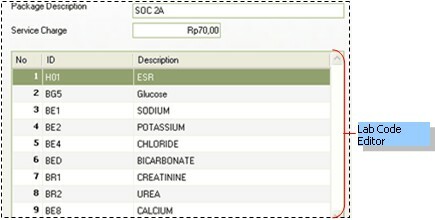 b. Click the Date Value in the clinic data library or click Edit button. c. Click OK to save changes or Cancel button to cancel changes. How to add, edit, and delete Service and Dosage Library? How to add, edit, and delete Customer Companies? How to add, edit, and delete Admission Rooms and Beds? e. Click OK to save changes, Or Cancel button to cancel changes. How to add, edit, and delete Lab Packages? d. Click OK to save changes, Or Cancel button to cancel changes. How to edit Key Generator? 3. Double click in Prefix column. Write the new prefix. Or Double the Description and write new description. 4. Click OK to save and click Cancel to cancel changes.